This is the most sought after sport fish in Texas and, in most pond environments, is the primary predator. 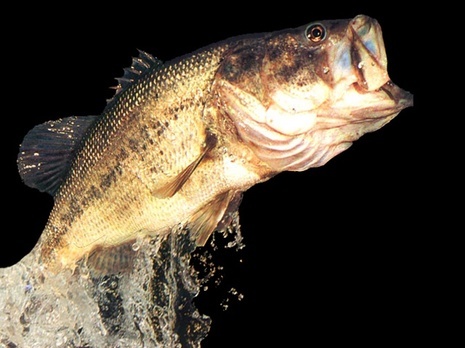 The northern largemouth bass species is native to Texas and is a widely stocked fish. While the Florida bass subspecies grows to a larger size, it’s very sensitive to cold temperatures and is more difficult to catch. Stocking Florida bass requires a lake of greater depth due to their temperature sensitivity. Channel and blue catfish do well in most pond environments and can be stocked in ponds of any size or as a supplement to bass and forage populations in ponds larger than 1 acre. Channel catfish are readily available for stocking and can grow quickly to a harvestable size when fed commercial feed. Pond owners wanting very large catfish can stock blue catfish, however, very large Blue catfish primarily consume fish and will compete with other sport fish for prey. In ponds being managed primarily for bass fishing, channel catfish are the preferred species. Bluegill has a reputation for overpopulation, but the bluegill is a fine sport fish and one of the only fish species which can produce the large numbers of small fish needed to provide food for bass. Absent bluegill, a quality bass population will probably not develop. This species can be stocked with bluegill in Texas ponds as supplemental forage. There also a fine sport fish and can increase angling opportunities. Because they eat snails they may also reduce fish parasites within a pond or lake. This bass species are another sport fish that can be stocked in any size pond to provide additional sportfishing. Hybrid striped bass will not reproduce in ponds. It is best to consult a biologist if you have plans to stock this species of bass. The fathead minnow is a relatively slow swimmer and very little verbal to predation. They’re useful in a catfish stocked pond that is not being fed commercially or in new bass ponds to increase first-year growth. After bass populations have been established, there are no long-term benefits of continuing to stock with fathead minnows. Crappie will compete with bass for food, eat the small bass, and tend to overpopulate and become stunted. If you are wanting to stock crappie, it’s best to allocate a pond just for this species. Do not confuse this sub species of catfish with channel or blue cat. This predator consumes large numbers of all species of fish, including largemouth bass.